I love to be outdoors and relish being surrounded by nature. When I rest my head on the floor of my tent, I feel safe and peaceful. When I see a deer, a snake or a bear, I feel joy and connection. Not everyone shares my comfort level. Last summer I took a good friend camping. She had never been camping before. While I’m the type of gal who mows her own yard, uses power tools regularly, and could probably fix my car in an emergency, my friend Carol lives in a condo, has her nails and hair done twice a month and typically has some macho guy in her life. I was shocked when Carol asked to go camping with me, but welcomed her company. Our trip went surprisingly well and here are a few tips that may help. 1. Prepare by doing some on line research. See what the camping area is like. Pick a pretty camping area that’s close to home and not too isolated. Check out temperatures, wildlife, recreational opportunities and any known dangers. If there is any wildlife in the area that could pose a threat, such as a poisonous snake or bear, find out how to identify the animal and what to do if you see one. Most likely, if you camp in a populated area, you will not see any wildlife other than the guys next door. 2. Easy does it. If you are going with seasoned campers, insist your first trip is a very short. I’d recommend an overnight trip for your first experience. If possible pick a camp site within a two hour drive from home. Also, insist that you are not included in any athletic marathon-type actives. Take a hike, but keep it less than 2 miles. If you feel like doing another hike later, select another hike less 2 miles. 2 miles in the woods is much more vinous than 2 miles at the gym. 3. Keep an open mind. You never know how you will feel surrounded by nature. Some people feel like they are born for the first time. Other people struggle with panic attacks and cut their trip short. If you find yourself feeling uncomfortable remind yourself this trip will end soon, do some deep breathing and see what you can discover for the rest of your trip. It’s very common with new campers, to experience joy, boredom, fear, and excitement. 4. Pack light but bring a variety of clothes to deal with heat and cold. Be prepared to let vanity go. Pack a swimsuit (even if you hate how you look in it), a warm outfit (like a sweat suit or a fleece outfit), a cool outfit (shorts and a tank top), and comfortable walking shoes. 5. Select and pack other items for comfort and safety. You’ll need a warm sleeping bag and pillow, a portable mat to place under your sleeping bag, drinking water (check with campsite), a working flashlight, toothbrush, personal hygiene products, bug spray or wipes with DEET, and food. Many campgrounds have lists of recommended items to pack. I like to carry a small pocket knife, a first aid kit, dental floss or a small rope, and a small handheld product called a screacher (this is great to use if you get lost in the woods). 6. Pack a few items to occupy your mind. Bring a comfortable chair and something non-electric so you can keep your mind busy. Books, magazines or crossword puzzles are good. It’s also fun to bring an outdoor game, like lawn darts or croquette. Many first time campers are not used to having so much free time and often struggle with boredom, unless their prepared. 7. Don’t take a solo trip. 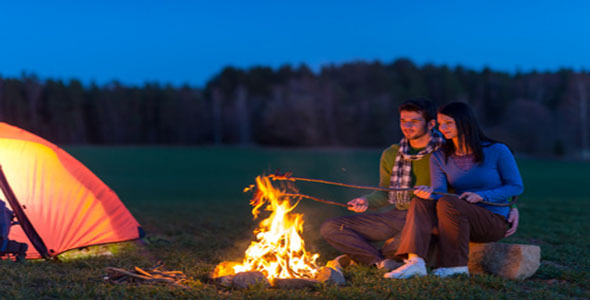 If you are single and want to try camping for the first time, try to connect with a group in your area. Many sporting stores know of well respected camping groups. If possible, always go with an experienced camper. 8. Take care of yourself. If you and your camping party get scared during the night, sleep in the car with the windows slightly cracked, doors locked and your keys in the ignition. That way everyone can get some sleep, but you don’t have to cut your trip short. If you get scared and your friends are not, tell someone you’re sleeping in the car, lock the car doors and crack the windows, but make sure your friends have the car keys so they can come to the car if needed. Most people learn to love sleeping in a tent, but others feel very vulnerable. Sometimes it’s nice to sleep in the car if you don’t feel secure in a tent. There is nothing like the peace of laying in a tent, and listening to crickets and other wildlife as I drift off to sleep. Tent camping is a wonderful, inexpensive hobby. But, it’s not for everyone. 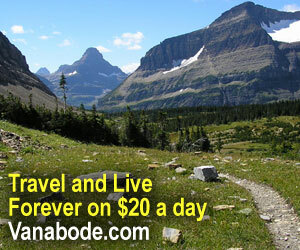 If you like camping but want a comfortable bed at the end of the day, book a reservation at a state or national park. Many of them have affordable rustic cabins or hotel rooms that have great access to nature.